Dr. Michael B. Gordon was raised in suburban Philadelphia and is a graduate of Franklin and Marshall College in Lancaster, PA. He received his optometry degree from the Pennsylvania College of Optometry (PCO) in Philadelphia, PA. He is a member of the American Optometric Association, the NH Optometric Association and is a Fellow of the American Academy of Optometry. Before moving to the Monadnock region, he served as an optometrist at Peterson Air Force Base in Colorado Springs, CO. While a student at PCO, Dr. Gordon was the Chairman of SOSH, the Student Optometric Service to Haiti, which was the recipient of the American Public Health Association Project of the Year Award in 1985. He has also delivered eye care to the poor in Mexico, Dominica and Nicaragua. He is a member of VOSH PA (Pennsylvania chapter of Volunteer Optometric Services to Humanity) and continues to provide eye care in northern Haiti. He has served on the board of Vision for the Poor, an organization which helps build sustainable eye clinics in developing countries. He was named a Granite State Fellow by the NH Lions Sight and Hearing Foundation in 2013 for exceptional service to the citizens of New Hampshire. 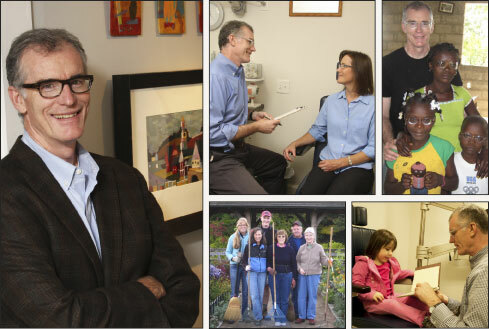 Dr. Gordon has lived in Peterborough since 1989 with his wife, Betsy, and has two grown sons. He enjoys hiking and drawing. He is an avid gardener and served on the Peterborough Parks Committee from 1999 to 2016. He has designed numerous public gardens in the parks of Peterborough. He writes a gardening blog, The Gardener’s Eye, chronicling his public and private gardens. He will be leading a tour of English Gardens in September, 2018 called The Passionate Gardener, Late Summer Gardens Of Southern England With Michael B. Gordon through Discover Europe.